I understand the financial requirements of this franchise opportunity and I would like to have someone contact me with more information. We have a question for you. What determines the success of a franchise? Is it luck? Coincidence? Why was Kona Ice ranked Highest in Franchisee Satisfaction by TWO separate agencies, or even #1 in Category (Dessert Franchise in Entrepreneur Magazine)? We think we might know why. Not every idea is franchise-worthy. Not everyone can offer the support. So why are some concepts instantly successful and others just aren’t? Over the last ten years, we’ve received a lot of awards - but the one we’re most proud of is our Franchisee Satisfaction Award from Franchise Business Review. We’ve made the top ranks over the last six years and in the last few years, we’ve had the distinct honor of coming in at #1 overall. We don’t think it’s luck at all. It’s the combination of a fresh concept, strong corporate support with a vision, and a desire to make the world a better place. So you may be knee deep in the franchising process with tons of questions, but we have just one for you. Why not Kona Ice? Proprietary Nutritional Product: Through Kreations Flavoring, we provide a product that meets all of the federal nutritional standards for schools. Ancillary Equipment: You can customize your business model with the four additional products we offer - the Kona Kiosk, the Kona Mini, the Kona Trailer and the KEV 2.0. Digital Marketing Campaigns: With a combination of Google Ads, Facebook, Instagram and national PR, we’ve got you covered on the web. Unmatched Corporate Support: You want proof? Highest in franchisee satisfaction with two different agencies since we’ve started. Hear it from our franchisees with testimonials on our website. Established Brand: With ten years in the industry and representation all across the country, and even internationally, Kona Ice is a well-developed and respected brand. Extremely Quick Startup: We’ll have you up and running in 30-60 days, guaranteed. Fixed Royalty: No penalties for succeeding. Incredibly Low Overhead: Approximately 6% food cost in an industry with an average of 32%. Community Involvement: With over $60 million given back, our communities have embraced us as the best fundraising tool around. Community Involvement: With our brand new Kona Krafted line of flavors, we're constantly following flavor trends to create new flavors to introduce to the shaved ice world. At Kona Ice, we believe you should go into business for yourself, but not by yourself. We pride ourselves on our franchising process. When you decide you want to start your own business, we understand that you don't want to wait years to make that dream a reality. We can guarantee that we’ll have you in business, generating revenue within 30-60 days of your deposit. The Kona Experience is not just for our customers. We strive to create a one-of-a-kind experience for our franchisees too. And that all begins at Kona Kollege. You’ll graduate from Kona Kollege with a 30 day plan that will have you primed and ready for success. On top of your startup plan, you will be set up for multiple follow up calls throughout your first year to ensure a smooth and successful start to your business! ISLAND RUSH Rush through the island of Gooba Jooba with none other than Kona the Penguin. 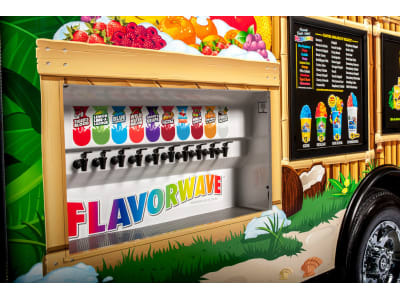 With fun gameplay, branded content and tangible rewards, your customers will love that they get to interact with Kona Ice in this unique way. Check out Island Rush on the Google Play and App Stores. KONA ICE READER APP Ever wonder how a penguin like Kona made it to the tropical island of Gooba Jooba? Well wonder no more! Listen as the narrator takes you through the story of Kona’s journey. Great for kids four and up, it’s a reader app that allows them to read along. There’s a few hidden games in there as well! We sell shaved ice, but that’s not what we’re all about. 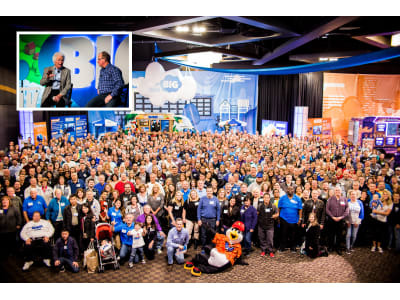 Company-wide, we’ve given back and raised over $60 million dollars to communities and organizations all across the country since our inception in 2007. It’s more a part of who we are than any other aspect of our brand. It is how we operate. To put it simply, giving back is who we are, selling the world’s most incredible shaved ice is what we do. One of the best things about Kona Ice is that the business model is simple. The brand works for you, not the other way around. Our goal at corporate is to make your Kona Ice experience as enjoyable and stress-free as eating a cup of shaved ice! Having built over 1,000 of these wonderful trucks, Kona Ice has perfected the KEV. This state-of-the-art truck is literally a mobile billboard for your business - it sells itself! The Kona Mini: The most popular ancillary unit is a smaller, more agile version of the KEV. It’s designed for indoor events and smaller outdoor venues. It’s a low-risk, high-reward investment that can truly make your business last all year. The Kona Kiosk: The Kona Kiosk hit the streets in 2015 and has been a huge success. Perfect for semi-permanent venues or large events, the Kona Kiosk can serve the same amount of people as the truck. It’s smaller than a truck, but it has the same visibility and could be the perfect supplement to your Kona business. The Kona Trailer: Sometimes you only need the back half of the KEV - and that’s exactly what you’ll get with the Kona Trailer. It’s perfect for large venues where you’ll be established for the majority of your season. The KEV 2.0: The newest addition to our Kona ancillary family has been the KEV 2.0. It’s a smaller, more agile version of the main Kona truck. It’s great for when you want to expand in your area, but want to keep the mobility of the truck! Kona doesn’t just sell gourmet shaved ice, it brings an unforgettable experience that appeals to the kid in all of us! We’re mobile, so really, we can be just about anywhere! Ever wonder if you’re making a difference? With Kona Ice, you’ll see it happening right before your very eyes. 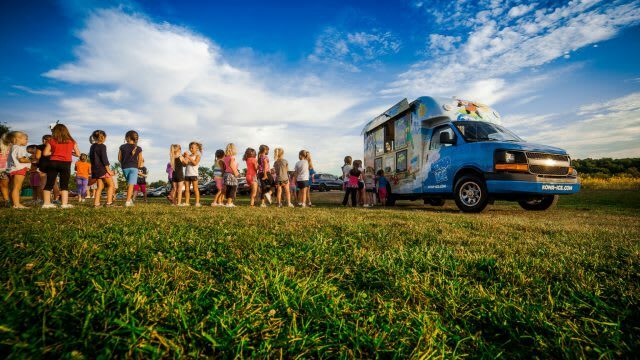 With over $60 million dollars given back to local communities all across the country, Kona Ice is defined by our community involvement. Because we’re a mobile franchise, this allows you to be directly involved in your community at every touch point. 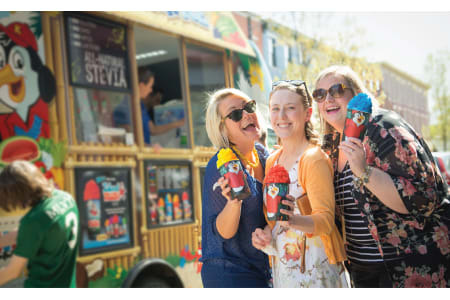 Ranked the #1 New Franchise by Entrepreneur Magazine in 2013 and Highest in Franchisee Satisfaction from 2014-2018 by Franchise Business Review, Kona Ice’s reputation is proclaimed as being one of the most innovative brands and “be your own boss” businesses around. In fact, we’ve made the Fastest Growing list the past six years. 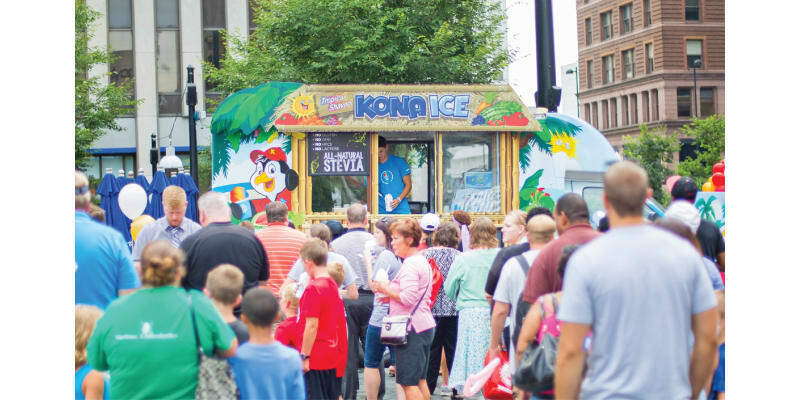 Kona Ice is thriving all across the map - from New Hampshire to California. And as of 2014, it’s been proven to work in three international markets as well. And in addition to that, roughly 75% of franchisees are purchasing a second unit within the first two years. Who knew shaved ice could be healthy? Kona Ice is redefining dessert, by creating a nutritious and delicious treat. Our constant innovation puts us on a pathway to success. The food and beverage industry is becoming exceedingly harder to excel in with the nutrition standards that have been put in place. The innovative and progressive spirit that our company was founded on continues in our search to provide a healthy option for our customers. Through our sister company, Kreations Flavoring, we have worked with flavor scientists to procure a completely proprietary product. From the nutritious base, filled with vitamins and sweetened with all-natural Stevia, to the completely proprietary flavor line we’ve developed that surpasses all other flavors currently available in the market, we believe we have the healthiest and most delicious shaved ice option around! Because we develop our own products, we’re constantly creating new flavors that can only be found with Kona Ice and discovering ways to make our product better for our customers. KONA KRAFTED In 2017, we unveiled our brand new Kona Krafted flavor line. With flavors that were specifically developed to cater to a more adult audience, we’ve been able to expand segments of the business like never before. Upon conducting market research, we determined this set of flavors would be our new Krafted flavors: Coconut Lime, Aprium Rosé Sangria, Wildberry Honey, Tamarind, Rose Petal Lemonade, Pineapple Sunrise, Bourbon Black Cherry Vanilla, Blackberry Mojito, Lavender Lemonade and Passion Fruit. You’ll want to try them all! We have pre-arranged financing with a sister company in place specifically for Kona Ice, giving you the opportunity to expand at your own pace. 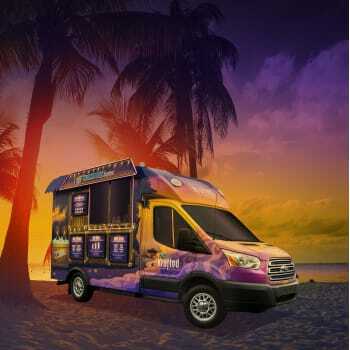 Kona Ice is the fastest growing mobile franchise in the country. Meeting or exceeding most expectations, franchisee satisfaction is through the roof! Don’t miss this opportunity! Territories are still available in major markets! Contact us for more information. DISCLAIMER: The information contained herein has been obtained from sources that we believe to be reliable, but its accuracy and completeness are not guaranteed, and does not constitute any investment recommendation. A franchise investment requires a personal assessment of your objectives, financial situation, skills, goals, and many other factors. Before making any investment decision, you need to consider whether this information is appropriate to your situation and needs. Copyright ©2019 by Franchise Business Review. All rights reserved.